Hong Kong happened to be our first big Asian city after three months in Southeast Asia and we were in for a bit of a shock about how pricey it was. We’d heard that Hong Kong is one of the most expensive cities in the world, but we’d naively assumed that like the rest of Southeast Asia we’d be able to find reasonably priced street food but that was not really the case. As a world-class city, Hong Kong has really cracked down on food safety and increased street food regulations over the past few years, making it not nearly as available as we hoped. What was great though was because it’s such a large city you can get any type of cuisine and we sampled everything from Taiwanese to Korean to Spanish and good old McDonald’s. We were also treated to a delicious meal at one of Hong Kong’s best restaurants Ham and Sherry, read the post here. In addition, because the city is really just a series of small islands, the budget accommodations were MUCH smaller than we’d been used to. The first place we stayed we found through Air BnB and while it was small, at least we had a large window and air con, even though it happened to be in the same floor as a legal brothel. We were lucky that no one knocked on our door! The second place we stayed was even smaller, with no windows and stained sheets that barely covered the mattress. We called it “the box” and even made up a song about the misleading name of the building it was in, The Mirador Mansion. Despite our budget limitations we actually loved Hong Kong. The city itself is a beautiful contrast of skyscrapers and an island/mountain landscape and has many parks and green space. It’s said that locals in Hong Kong like two things most about their city, the shopping and hiking, and there is definitely an opportunity for both. If you’re looking to visit Hong Kong in the future, we’ve put together a list of our favorite things to do in the city. We’d decided to stay in the Kowloon area, just across the harbor from Hong Kong island, and where a lot of tourists tend to stay. One of the great advantages of staying across from HK island and the business district is that you get an amazing view of all the skyscrapers right on the water. From our guesthouse/tiny room/brothel it was just a short walk to the waterfront where we strolled along, enthralled by the views and made our way to the Garden of the Stars. A cool little area with handprints of Chinese and Asian movie stars similar to the Hollywood Walk of Fame in LA. This is supposedly the most popular market in Hong Kong and we were excited to see how it measured up to the ones we’ve been to throughout Southeast Asia. Alas, we were a little disappointed at how touristy it was, filled with stalls trying to sell you knockoff watches, handbags, toys and more. Also, there wasn’t really a food section which we’d been anticipating, hoping to find dinner. Instead there were a lot of surrounding Chinese restaurants, most of them hawking overpriced seafood, and the one we tried was just OK. If you’ve never experienced a market before, I’d say you should definitely check it out- we’re just a bit jaded from our more authentic local market experiences. This short ferry ride connects Kowloon to Hong Kong island and is a great way to see both sides of the city from the water. The even better part is that it costs about 50 cents (USD) a person to take it, which is practically like a free boat ride on the harbor. It drops you off right in the Central area of Hong Kong and it's super easy to walk or take the subway to various other locations once you get there. The views from the top of the peak are well worth the wait for the tram ride that takes you to the top. We’d never been on a tram before that ascends at such a sharp angle and moves so quickly! Once you get to the top though you’re able to see the entire city, nearby islands and the harbor and there is a giant mall with a lot of different food options and hiking/walking trails nearby. Since we were there on a Sunday the Peak area was filled with a ton of locals and tourists alike. We also had the chance to try a noodle place I had on my list called Mak’s Noodle that I’d found out about from the Nomadic Matt blog. We had some delicious cold noodles with BBQ pork, dumpling soup, and a seasonal green veggie with oyster sauce. Mak’s has multiple locations and I’d highly recommend you find one if you’re ever in HK. We kind of wished we had worn more sporty clothing and budgeted some more time for the Peak because there were some really great trails nearby. We took a walk down one of them for a bit and saw our first HK waterfall! I’d heard that the mid-levels and the SoHo area were a great place to just walk through and explore, filled with lots of trendy shops and restaurants. The mid-levels are particularly unique as they are the longest outdoor escalator series in the world, and you’re able to get off at different points and explore the streets nearby. The escalators actually go down in the morning for the work crowd but reverse at some point and go up the street the majority of the day. This is also an area where a lot of businesses are based as we found a lot of people in business attire frequenting the restaurants offering “set lunches”; basically a deal of three courses for a set price which is often a good deal compared to dinner or ordering items separately. Overall the whole SoHo area was a little bit out of our price range, but they had some cute looking boutiques and shops that I were fun to wander by and gaze at from afar. We also took a short walk down Hollywood Road which is known for Chinese antiques. Something I found pretty interesting was that antiques here in Hong Kong could be hundreds of years old, whereas in the US when you’re looking at antiques they are usually from the 20th century. The Ladies Market is pretty similar to the Temple Street Night Market but this one was a bit more enjoyable because the whole Mong Kok area is quite a scene! There was one street that reminded me a bit of being in a Chinese Times Square and there were a ton of local food options. While it wasn’t street food per say, most shops were takeaway windows only filled with popular Hong Kong snacks like fish balls, dumplings, pancakes, and meat sticks. We settled on a little dumpling place that had some seating and an easy to decipher menu. We tried three different kinds of dumplings, some steamed and some pan-fried and it came with soup and a delicious milk tea with bubbles (tapioca balls). I’m a little bit obsessed with bubble tea so this made me super happy! A lot of people tend to visit Hong Kong for just a few days and manage to barely see the main tourist sites. But because we had a bit more time this allowed us to explore some of the nearby islands known for their beautiful beaches, views and hiking trails. We decided on Lamma island because you're able to depart the ferry and hike from one side of the island to the other, have lunch at a delicious seafood restaurant, check out the fishing village, and then board another ferry from the side we ended on. The hike itself was about two hours and it definitely had a fair share of hills. We were glad we’d dressed in our dry fits because the temperature was in the 90s and by the time we got to the other side we were quite sweaty. I’d heard that there was a plethora of delicious seafood restaurants in the village and we just ended up picking the one with the best deal. We got 2 giant scallops, 8 big shrimp, steamed clams in a spicy black bean sauce, fried calamari and two beers for about $30 USD. It was by far some of the best seafood we’d had since we left and we were pleasantly surprised since it was such a touristy strip of restaurants all seeming to do the same thing. If you visit Hong Kong, you’ll inevitably be told that you need to visit the cheapest Michelin starred restaurant in the world, Tim Ho Wan. Known for it’s amazing baked BBQ pork buns and its dim sum, I can tell you right now that this place doesn’t disappoint. Sometimes I worry a bit about those restaurants that are so hyped up because it’s hard to live up to expectations but this was not the case. Everything we tried on the menu at Tim Ho Wan was absolutely delicious, especially the baked BBQ pork buns that could literally be eaten for breakfast, lunch, dinner or dessert. We also tried a variety of steamed dumplings, and some BBQ pork vermicelli noodle wraps that were really different and delicious. We’d gotten a tip to visit this garden from a New Zealand family we’d met on Lamma island as one of the most beautiful places in Hong Kong. When we arrived we were excited to learn that the gardens and monastery were free of charge to visit! As soon as we entered and saw the Pavilion of Absolute Perfection against the backdrop of the perfectly manicured gardens and the Hong Kong skyscrapers in the distance I knew that this would be one of my favorite places in the city. The garden also had a special exhibit with beautiful Venetian Murano glass vases and pieces of art that was a free exhibit that day. We also encountered our first rockery in the garden. A rockery is (more info). The gardens connect directly to the Chi Lin Nunnery and besides it being stunningly designed it was also a very peaceful place to visit. We found out that a lot of museums are free on Wednesdays in Hong Kong and knew we had to take advantage of this. I always love science museums no matter what the city because they always are the most hands on and interactive and the Hong Kong one was no exception. Although it was definitely geared more towards children and families it was still fun to wander around and play in all the exhibits. We were also excited to learn that the museum had a special food science exhibit! I took some photos that I’ll have to share with my former employer IFT, it would be great to have an exhibit like that at a museum in Chicago or anywhere in the US! I also loved the exhibit on the dinosaurs, one of my favorite subjects as a kid, and it was interesting because a lot of dinosaur remains have actually been uncovered in China. Jeremy really enjoyed all the picture illusions placed throughout the museum! Stanley is an area on Hong Kong island (more information). It’s also quite near Repulse Bay which reminded me a bit of the Malibu of Hong Kong. In fact a lot of Hong Kong celebrities have second homes there, just like Malibu. The bus ride there had some great views of the nearby islands, beaches and gorgeous homes nestled in the hills. Stanley is a bit further from Repulse Bay and has a great market along with nearby hiking trails and a waterfront area filled with shops and restaurants. We enjoyed wandering down some of the trails and even found our own private beach, but we were a bit wary of multiple signs stating to watch out for wild pigs and snakes! Lan Kwai Fong is an area near Central on Hong Kong island known for it’s great bar scene. We were there on a Thursday night, which happened to be ladie’s night, which was nice because I got some drinks for free! It’s filled with lots of different bars, places that offer shisha (hookah bars), and cheap drunk food like kebabs and pizza. We lasted until around 11:30pm before heading back and it seemed like things were really just getting started at some of the nearby clubs. It’s definitely a scene filled with a variety of folk from business travelers drinking on the company dime, people wrapping up happy hour, to locals and tourists alike out for a good time. 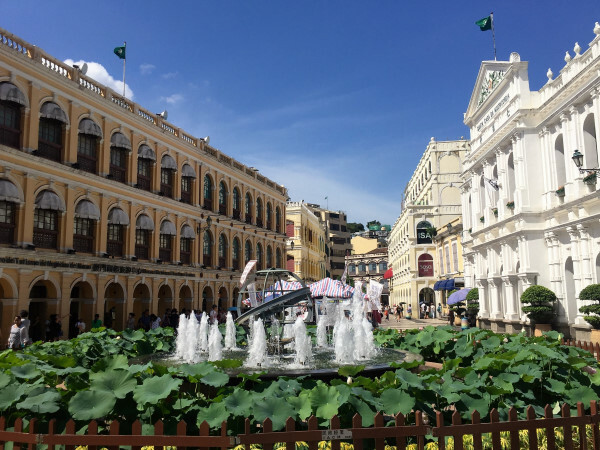 We were told that if you had the time it would be worthwhile and interesting to visit Macau, which is about an hour ferry boat ride from Hong Kong. But you should definitely note you’re kind of entering mainland China (although you don’t need a visa), it is necessary to bring your passport and you go through customs. It’s known for its huge casinos and also its Portuguese history and architecture since it was governed by the Portuguese until 1999. The ferry is unlike any ferry we’d taken before, in fact it’s really just a giant speedboat- it's like the fast train of the water. When you arrive to the ferry terminal there are a bunch of different casino shuttles that will take you to their casino free of cost. We really wanted to see the Venetian, which is now known to be the biggest casino in the world, so we hopped aboard the shuttle. It’s really similar to the Vegas casino but the atmosphere is completely different. No one is drinking, and the betting minimums were around $50 USD. People take their gambling there very seriously! After eating lunch in the huge food court area, which actually had delicious and reasonably priced options, we hopped another free shuttle at a nearby hotel to the downtown area where we wandered about the Portuguese area. We headed to Senado Square, saw the ruins of St. Paul, hiked up to the ancient city wall, and tried a Portuguese egg tart (delicious) before heading back to the ferry. Overall I’d say it was definitely worth the trip to see such an interesting and varied place.